When I was a girl I loved My Little Pony. I was thrilled that these childhood favorites stepped back onto he scene when I had a daughter, as she loves them as much as I did. I cannot see one without smiling because they bring back such great memories. Does your little girl love My Little Pony too? If so, she is sure to love the DVD My Little Pony Twinkle Wish Adventure! Ashley and I had a blast watching it together. It was a hit with me as it brought back memories of watching them as a child. She loved it because it was all new to her, featured some of her favorite characters, and has a great story. There are a lot of great extras on the disc as well. Wishes do come true as those lovable colorful MY LITTLE PONY ponies are back in the all new animated feature length movie MY LITTLE PONY: TWINKLE WISH ADVENTURE, arriving on DVD on October 13, 2009 from Shout! 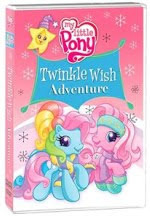 Factory in collaboration with Hasbro, Inc.
MY LITTLE PONY: TWINKLE WISH ADVENTURE follows Pinkie Pie and all her pony friends on a fun-filled adventure as they discover that friendship can make wishes come true. All the ponies can’t wait for the Winter Wishes festival where the Wishing Star grants each pony one special wish. But when the Wishing Star disappears, they go on a journey to find it. Will they make it back in time for the festival? 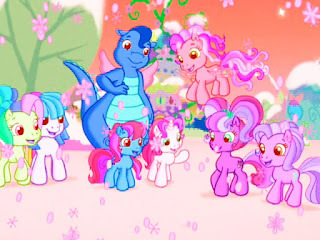 Find out by joining Pinkie Pie and all her pony friends on this magical journey of discovery. The DVD is jam-packed with fun extras including a new animated short “Elefun and Friends,” the “Waiting for the Winter Wishes Festival” prequel, six sing-along songs, downloadable coloring sheets, cut-out pony ornaments and four fun activities. Sounds great doesn't it! This would be a great DVD to have on hand during the holidays. I don't know any little girl who wouldn't love receiving this as a gift! Would you like one for the special child in your life? One lucky reader will win a copy of this terrific DVD. All you have to do to enter is leave me a comment telling me your favorite childhood tv show! This is mandatory for entry. Be sure to leave a separate comment for each thing you do. Also be sure to leave your email address so I can contact you if you win! Deadline to enter is Friday 11/13 at 11:59pm CST. Winner will be selected and notified on 11/14. Winner must reply to my email within 48 hours, or an alternate will be selected. Be sure to check your spam folders, as this has been a problem before. Ramblings of a Texas Housewife Product Review and/or Giveaway Disclosure- I have received no compensation from Shout Factory other than the offer of free product to review and/or giveaway. Any opinions expressed on Ramblings of a Texas Housewife are my own. My reviews are never reviewed or edited in any way by sponsors. My favorite TV show as a kid was Sesame Street! My favorite as a kid was Rainbow Bright! I follow on friend connect! I loved watching the Flintstones when I was little. This will REALLY tell my age! When I was a child, my favorite tv show was The Mickey Mouse Show. mr rogers neighborhood and electric company was my favorite. I follow your blog and I will post your entery on my blog. When I was a little girl my favorite show was care bears. My favorite was the Brady Bunch. I've seen every episode dozens and dozens of times. I loved Saved by the Bell! My favorite show was The Muppets. All else stopped when it was time for Gilligan's Island! My friends are still jammin me about this! I loved the Munsters as a child. Mine was Sesame Street! Thanks for the chance. I used to love watching The Jetsons. My fav would be she-ra! Thanks for the contest! I had so many favorites growing up. Sesame street when I was really little. My mom said I would melt down if I missed an episode, lol. One time my dad had to pretend to be burt & earnie on the phone to get me to calm down. My favorite show was The Mickey Mouse Club. My favorite show on tv when I was little was a PBS show based out of Cincinnati called "Uncle Al." Used to drive my dad nuts because it was on opposite Phil Donahue. I also loved "The Electric Company." I follow you on twitter and tweeted about this giveaway. I added your holiday gift guide button to my blog. My favorite show as a child was Sesame Street. I am following now on Google Friend Connect. My favorite childhood show was The Smurfs. My favorite show as a kid was a local show called Captain Jenks! Adventures of the Gummi Bears! My favorite TV show as a kid was Care bears. I loved Fraggle Rock..still do except we had to by the DVD's! My favourite childhood show was Sesame Street. I loved Dinosaurs "not the momma"
ALF!!! Thanks for the chance! Brady Bunch, Scooby doo, and Carebears. I loved The Muppet Show, thanks! I'm following you in Google Friend Connect! I loved Rugrats and Rocko's Modern Life. My favorite was Fraggle Rock! I have your Gift Guide button on my left sidebar. I watched Care Bears and Sesame Street!